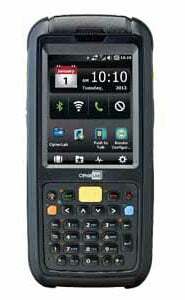 CipherLab CP60 - Laser, Bluetooth, GPS, Numeric Keypad, 5 megapixel Camera, IP67, Transflective, 3600 mAh Battery, USB Kit, Smartshell, US. Interface Cables And Charging Cradle Sold Separately. Designed specifically for applications in transportation and logistics, warehousing, manufacturing and field service, the CP60 is rated with IP65 standards and can withstand 1.8m drops onto concrete, which safeguards its productivity in harsh environments. Along with a powerful 1 GHz processor, CP60 provides operating system options and speeds up all calculations and data input process. CP60 is armed with the most flexible wireless communication options in the forms of 3.8G HSPA+, 802.11a/b/g/n, and Bluetooth V2.1. With the rise of 4G technology, CP60 is also ready to provide 4G LTE option. Having GPS / AGPS gives you the power to locate your staff and never get lost. Its on-board 4 GB flash memory coupled with 512 MB SDRAM, allows workers to store more data and run more software at maximum speed. Additionally, the 5 megapixel autofocus camera and versatile reader options give you dependable data under a vast variety of conditions.